What a day, but it didn’t turn out too badly. The wife and I were heading out to her sister’s house in New Jersey but were going to meet her mother first in Penn Station and then catch the train from there. The wife left about fifteen minutes before me so she could pick up the tickets. I headed to the subway and after waiting for the train for about ten minutes I noticed a small sign that said I would have to catch it on a different track because they were doing repairs. Well I am already running a bit late so I head over there and catch the train but it isn’t going to Penn Station, it is going up the East side of Manhattan. I end up going to Grand Central and catching a cab to Penn Station and get dropped off at the LIRR entrance and have to run all the way through the place to the New Jersey Transit trains. I get there just as they are announcing “All Aboard” and, not seeing my wife anywhere, figured she had already gotten on the train so I hoped on. Now, of course, I had left my cell phone at home so I couldn’t call her. Instead I walked the length of the train to see if I could see her, but she was nowhere to be found. So far so good. Now we proceed to Newark and are then held up for about 15 minutes because some bridge is open and there are two other trains backed up. Anyway, I arrive in New Brunswick about 15 minutes late and no wife is getting off the train. No mother-in-law either. This cannot be good. And no sister-in-law waiting at the station. Luckily, however, there was a bar right across the street from the railroad station. And what is the Bar Man to do. 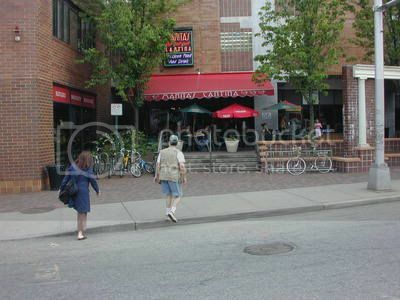 This is a fairly generic looking Mexican restaurant that pulls in a lively crowd from Rutgers when school is in session. Being the summer there weren’t too many people in the place today. There is a big light wood bar with a darker wood ledge for your foot. Light wood bar chairs with black seats. Above the bar are racks for hanging the glasses. There are mirrors and mirror backed shelves behind the bar. The Bar Specials and Happy Hour information is written in fluorescent colors on three of the mirrors. The floor has orangish tiles kind of like the kind you do see all over in Mexico. There are Mexican style designs on the walls above the large glass windows and a desert scene heavy on cacti fills up the rest of the wall. There were a couple of piñatas hanging from the ceiling. I had a decently strong frozen margarita. After letting the initial brain-freeze set in I got a bunch of quarters and went out to the pay phone. I got hold of my sister-in-law who said my wife had called her and had missed the train because her luck with the subway was even worse than mine. She told her sister to meet me at the station but, because the train was late, she didn’t see me and figured I missed the train too. Oh, the evil twists of fate I thought as I merrily returned to my margarita and waited for the next train, my wife, my mother-in-law, and my sister-in-law. Everything had a fairly happy ending except for the abuse that I took for not having my cell phone with me. And, of course, my wife made matters a bit worse by searching for me in the bars in Penn Station figuring that I too had missed the train. Bar Man gets in trouble for actually being on time and catching the right train. Go figure. Today was a most interesting day. The three person German television crew showed up at my apartment right on the button at 11:00 A.M. to do some filming of me hard at work at my PC making an entry to my blog. Then they took off for another assignment that turned out to be shopping in my neighborhood for food. 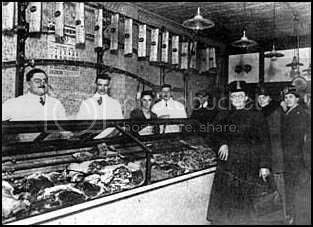 Apparently they knew of a German butcher shop in the area and they loaded up on sausages. I wonder if it was Staubitz, the one that I usually go to. Here is a picture I took at Staubitz the last time I was there. At any rate I then met up with them again at Rocky Sullivan’s. They picked the place and it was one that I have already been to so I cannot count it towards my thousand. Oh well, sometimes one has to make sacrifices for one’s art. Things got better after that though as we hit a couple of bars that were new to me. 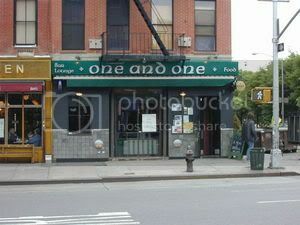 Probably one of the most well-known bars in Manhattan at 915 3rd Avenue, right on the corner of 55th. I just have not made my way this far uptown yet but certainly will be doing so in the near future. Bars everywhere you look. P.J. 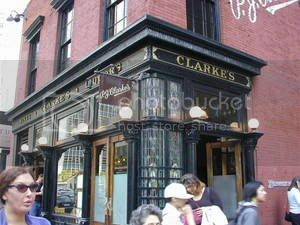 Clarke’s is another bar that lays claim to being one of the oldest bars in New York having been around since 1884. If you haven’t been here you still may have seen it, it was featured in the 1945 film “The Lost Weekend” starring Ray Milland. He won an Oscar for his portrayal of an out-of-control alcoholic. I believe it still has a link to stardom because I think Timothy Hutton is one of the current owner’s. If the Friday afternoon crowd was any indication of the kind of business they usually do he made a sound investment. 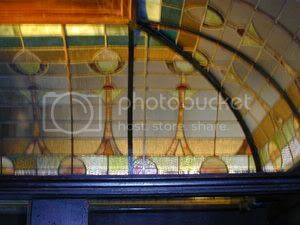 It has, as you would imagine, a great old bar complete with a brass rail and there are absolutely gorgeous fixtures including a stained glass covering to the men’s room. Makes it seem kind of like you are taking a leak in a church. And yes, this picture was taken from inside the men's room. There is a clutter of bottles and blackboards behind the bar. One of the blackboards advertised “Artichoke Dip and Pigs Ina Blanket.” There is also any oyster bar across from the drinking bar. Just plain wood barstools and the ceiling is patterned tin but painted dark brown. The floor has a small white circle pattern to it. There is a nice old pendulum clock hanging on the wall next to the bar. The windows up on two sides are large and the ones in front were open giving an almost outdoor feel to that end of the bar. A friendly crowd and, as you might imagine, we attracted a bit of attention so I got a chance to engage in a few interesting conversations with people who wanted to know what was going on. The have a nice selection of beers and I had a draft Grolsch. I like Grolsch but you don’t see it on draft in too many places. 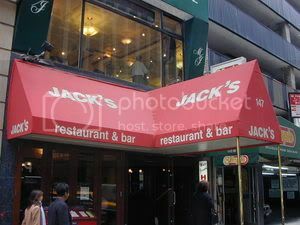 This is another venerable establishment at 150 West 47th Street. And I got to meet the venerable Steve Dunleavy of the New York Post. He was there with a photographer too so we had the somewhat surrealistic experience of a film crew filming me being interviewed. Mr. Dunleavy, as anyone who is familiar with his work probably knows, is a character in his own right and a most pleasant conversationalist. After the interview we sat around and had a few more drinks together and then I headed home and he headed back to file his story. When I got home there was a message for me from him double checking a fairly minor fact to make sure he got it right so I certainly give him credit for being thourough.. I hope to have drinks with him again in the future. He is a most interesting and pleasant drinking partner. Keep an eye out for the Sunday edition of the New York Post, there should be an article about me in there. You might want to check out the Sunday edition of the New York Daily News too, I have a hunch there will be something in there as well. Well, as you can imagine I didn’t have a whole lot of time to take notes at either P.J. Clarke’s or this place so forgive me for the paucity of detail. 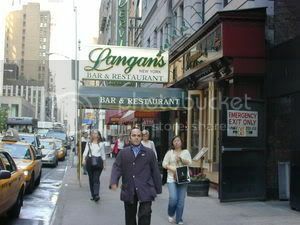 Langan’s is an Irish bar and the bartenders are most accommodating. That may have been because I was with Mr. Donleavy and to say he is a regular is like saying the ocean is wet. His face graces the screensaver on the PC behind the bar and there is an old-time ship’s lifesaver at the end of the bar that has S.S. Dunleavy emblazoned upon it where the name of the ship would normally appear. I think his image is etched in glass somewhere as well but I didn’t see it. There is, however, a large portrait of Michael Caine on the wall, and his eyes seem to follow you everywhere you go (except in the bathroom). In fact the décor consists mostly of pictures of actors, many of them taken with the owners of the place. I understand that the food here is delicious and when time permits I will certainly visit again. I had a draft Heffeweiss. The guy interviewing me coached me on how to say it correctly so that when he asked me what I was having people would be able to understand me. My mistake ordering a German beer. I had a few Dewar’s and sodas later with Mr. Donleavy and some friends of his who dropped by on their way to the Yankees/Red Sox game. Well, all in all it was a most enjoyable day. I hit two new bars bringing my total for the year to 529 leaving me with 471 left to go. I took the N train back to the station on Atlantic Avenue, stopped in at Hank’s Saloon for a quick Dewar’s and soda and went to meet the Mysterious Chinese Woman for dinner at Armando’s. Befitting her name she is a bit camera shy so she didn’t accompany me on my travels today. 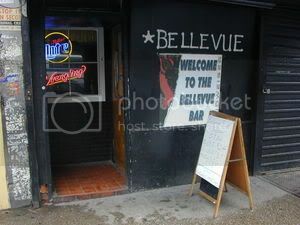 There are a number of interesting bars in this area and I thought I would explore a few of them. Another kind of grey, rainy day and it seemed appropriate. For some reason if you ever see this neighborhood depicted in a film it is always either a grey, rainy day or it is night. This is a typical bowling alley bar, which means a bit on the tacky side. 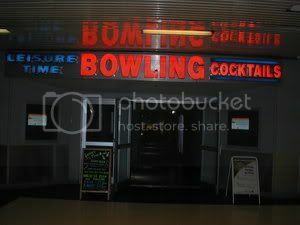 They have done a nice job remodeling the bowling alley itself, but it looks like they pretty much forgot about the bar. The bar itself has a red Formica top with a fairly wide light wood edging/armrest. The front of the bar is light grey with a raised pattern of small white circles. The bar chairs are light wood with turquoise seats. The floor immediately surrounding the bar is dark turquoise and light grey square tiles. The rest of the floor is covered with a kind of ratty dark patterned coffee that was thread bare in many places and suitably stained. Metal, somewhat industrial looking lights hang over the bar. The fanciest thing in here was a large, detailed model of a four-masted sailing vessel in a Plexiglas case that sat on one end of the bar. This was kind of appropriate because this is Fleet Week in New York and there are a lot of ships and sailors in town. There was a bowling tournament for sailors that pitted teams from the various sailing vessels against each other. The stuff behind the bar was pretty plain as well, dark grey wooden shelving and metal ice-chests for the beer. The rest of the place is outfitted with a few diner type tables and diner type turquoise and red booths. One neat thing they have here is beer towers. These are tall glass cylinders about six inches in diameter that hold three pitchers of beer. There is a spigot at the bottom for pouring the beer. These are ordered from the waitresses in the bowling area and then you can set them on the tables behind your seats. One bad thing is that they have a policy of charging you a fairly still price for a shot of any kind of booze. That isn’t so bad, it is New York after all. What makes no sense at all is that if you order a drink that calls for more than one kind of liquor (can you say cocktail) you have to pay the full price for each shot of a different booze that it calls for. Obviously nobody in their right mind would ever order that type of cocktail here. I seriously doubt if anyone would go here for a drink unless they were bowling, or The Bar Man. A soldier in fatigues made a sweep through the place with a very large German Shepard. A few minutes later another soldier, this time a female, similarly attired with an equally large dog made another sweep. I was kind of hoping for a dust-up between the members of the various branches of the service but nothing happened. I had a bottle of Bass Ale. This is a place that you might easily pass by as you walk along 44th. I spotted it the other day when I went to St. Andrews and made a mental note to return. The opportunity presented itself today. 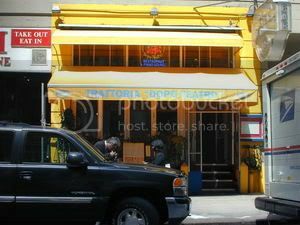 It is located at 144 West 44th Street between 6th and 7th Avenue. It is owned by Jimmy Glenn, who is a professional trainer of boxers. As you might imagine the walls are covered with aging photographs and other memorabilia that he has collected over the years. The surface of the bar is covered with a decoupage of newspaper photos and other pictures of boxers. The place is quite narrow and fairly deep. The bartender was a friendly fellow and he explained that the house drink was a special concoction called Jimmy’s Hurricane. Apparently this is the special concoction of that Jimmy dreamed up one day when he thought he should have a signature drink. I might have to stop in to try it one day, but today was not that day. The Jukebox is supposed to be one of the best in the city, at least according to the bartender and a review of jukeboxes by the Village Voice. The selections have been personally compiled by Jimmy. Similar to my feelings about St. Andrew’s, this is the type of bar you want to visit if you visit New York and Times Square. This bar hasn’t changed much since it opened about thirty years ago, except perhaps for more clutter and stuff on the walls. I had a draft Becks. 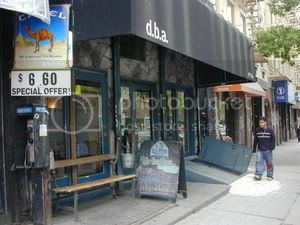 Whoot, another great dive bar over at 538 9th Avenue. And what a classic this place is. 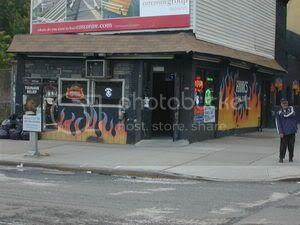 In fact I would have to say it is the quintessential New York dive bar and appropriately located hard by the bus terminal. Now don’t get me wrong, this is a dive bar in the very best of ways. The furniture, what little there is, dark booths mostly, as well as the bar-stools are old and beat up. I think there might have been a couch in the back too. The bar has a turquoise Formica top. Absolutely nothing fancy behind the bar but pictures of old-time strippers, Betty Paige in particular, hang high on the wall behind the bar. I understand they also play videos of Betty Paige doing her thing. There are also posters of rather cheesy movies both behind the bar and on the opposite one as well. The one that caught my eye was for “Attack of the 50 Foot Woman. I have a refrigerator magnet of the same poster. Paper plates on the bar with a selection of potato chips and cheese doodles were a nice touch. The last place I saw that combination was at Montero’s in Brooklyn. The drinks here are supposed to be quite cheap but the bartender actually bought me mine. When he heard this was my 527th bar he said he was going to play the number. I guess the number 527 has been a long time favorite of the owner’s. Life is strange. The clientele here about what you might expect, but a decent enough bunch. There was an interesting woman of a certain age, well beyond mine; I am sure, quietly drinking at one end of the bar of guys at the other end. I understand that this place is a bit of a favorite with the reporters at the nearby Daily News. An interesting bit of trivia, and coincidence. When I was wondering where to have my 500th bar celebration I got an email from Jimmy Duff, who now has a bar in Brooklyn named Duff’s, inviting me to have it there. I am certainly going to visit his place but because he opened late and it is a bit out of the way for me, in Williamsburg, I decided upon The Gate instead. Anyway, as it turned out, he used to be involved with Bellevue and when he left he apparently took a great deal of heavy metal memorabilia with him, so that might explain why the walls were a bit on the barren side. If you need to go to the bathroom this is a good place to check out. The bathroom is built into a large, thankfully no longer in use, walk-in freezer. I had a bottle of Heineken and headed home. Tomorrow might prove to be an interesting day. A film crew from ARD GermaNTV is going to follow me around for a piece that will be airing in Germany next Wednesday. They are going to show up at my place at about 11:00 A.M. to film me building a blog and then follow me around to a couple of bars. TV trickery, they are filming me creating a blog before I actually go to the bars with them so the TV crew can leave early for the Memorial Day weekend. Well, "Raging Bull" was filmed in reverse chronolgical order because it was easier for Robert DeNiro to lose weight than to gain it so I guess this is okay. I headed out with D.B.A. specifically in mind but overshot it a bit and hit another bar first and then another bar after and somewhere along the line forgot about my reminder to lay off the Manhattans. Oh well, what is a poor boy to do. A bit of a barren looking bar but the effervescence of the bartender, Allegra, more than made up for it. What a sweet deal she has, she lives right above the bar. I suggested that they install a fireman’s pole and she could just slide down whenever a customer rang a bell for a drink. They have a fairly decent selection of draft beers and just plain shelving behind the bar. The bar has a tin-like tile surface and the front is plain wood. The bar chairs are also either metal or plastic that looks like metal, I couldn’t really tell. Maybe a combination of the two. The rest of the chairs in the front part are the same, only taller. They sit around high round tables mounted on tall iron poles. The walls are a dark mauve and the flooring, except for the black tile around the bar is shiny varnished wood. The ceiling is cream colored and recessed lights giving off an orangish glow illuminate the place. There are fairly large windows on two sides, the bar is located on the corner of 1st Avenue and 1st Street, and, given that the day was kind of grey, this probably contributed to the aforementioned barren ambience. Also, the place is quite wide and because there weren’t many people it felt empty. There aren’t enough tables to fill the space either. There is an area in the back with one large black booth and several small black tables surrounded by short wooden stools. 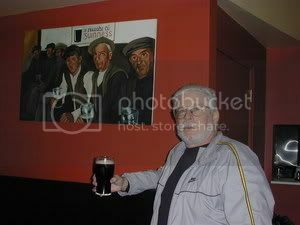 There is a large picture of fishermen painted on the wall and a smaller picture of geezers drinking next to it. The back seems cozier that the front. Just up 1st Avenue a couple of blocks, between 2nd and 3rd Streets is this narrow, dark bar that is a bit more to my taste. The bar is not overly long and is dark wood with the top covered in copper. It has a brass rail. A soccer game was playing on the one television tucked away high in the corner. There are several small wooden tables and chairs in front of a wooden bench along the wall behind the bar chairs. There is also a wooden ledge in a corner with bar chairs in front of it. They have a nice sized outdoor area with tables and chairs for having a drink, when the weather turns nicer. All and all it is kind of a scruffy place with peeling muddy brown paint on most of the walls. Even the brick wall behind the bar, that looked like it could be quite nice, was painted the same muddy brown. You come here for the beer and Scotch and Whiskey, and of that they have a lot. 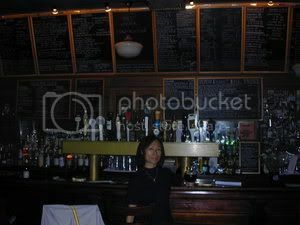 The back of the bar is dominated by numerous blackboards that list their considerable selection of beers, Scotches, Bourbons, Vodka,…well, you get the picture. Despite the playing of the soundtrack from Sound Of Music in the background I felt right at home. They had two cask conditioned ales and I had one of each, a French Heather Ale that tasted a bit sour to me but may very well be the style, and a Dark Star IPA that was very good indeed. The mysterious Chinese woman tagged along and had a Framboise Boon, a Belgian beer that is raspberry flavored. Not bad at all though. Heading back toward One and One at 15 First Avenue is this very dark, but dark in a nice way, bar. And here is where my resolve began to slip. There was a metal iguana on the wall and red-and reddish-orange patterned teardrop shaped glass lights hung over the dark wooden bar. More of the same type of lights, but a few blue ones too, hang in the back. The lights on the wall are ornate metal. There is a good sized back area and an even more remote private area further back. With the Gipsy Kings playing in the background this place had a very Mexican feel to it, from my perspective. 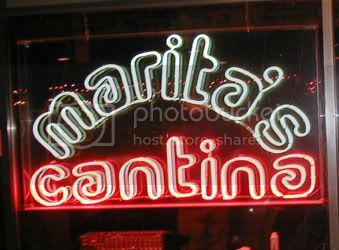 I asked the bartender if she made margaritas with fresh lime juice she said no, with a mix. When I expressed my disappointment she offered to squeeze a few limes to make one for me. Because the day was so dreary I opted for a Manhattan instead and, even though the bar stocks no bitters, a key ingredient to a good Manhattan, it still tasted pretty good. I like mine made with Maker’s Mark and a traditional Manhattan calls for Rye whiskey, so I guess I shouldn’t quibble about the lack of bitters. Well, here is where I lost focus. I was chatting with the bartender, Emily and then started talking to the owner, Charlie. It turned out he is related to one of the waiters at Capucine’s (I visited that place for dinner last Saturday). Well, one thing led to another and I had a second Manhattan, stopped taking notes, and this is where the day ended. Well, two Maker’s Mark Manhattans, three bars for the day, 523 for the year and 477 left to go. The mysterious Chinese lady got me a cab. 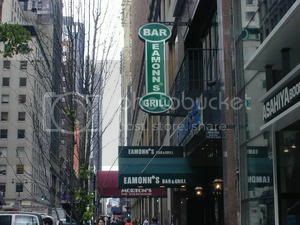 I decided to hit a few more from “Jimmy’s Best New York Irish Pub Guide,” and I did, a couple. But I picked a few in the Time’s Square area and this is fertile ground indeed. I will probably return tomorrow to hit a few more in the same one block stretch, both sides of the street, where I ended up today. 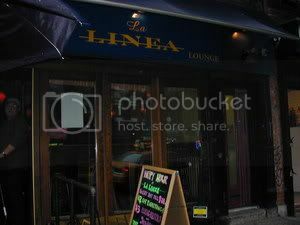 A narrow bar and restaurant with pale yellow walls and ceiling at 147 West 40th Street.. Blurry watercolors of the Irish countryside line both sides of the entry way and small adjacent dining area that holds a few tables. The wooden bar has a silver bar rail and is divided into three sections by wooden partitions topped by glass panels with wide frosted edging. There are 16 spigots sticking up from the single silver station with the ominous unmarked black handles, but only 8 draft beers, and no Guinness; shocking. Fairly plain woodwork behind the bar with a couple of large mirrors and tiered shelving in front of them holding the liquor. Between the mirrors is a narrow space where a clock that is two hours off and probably not running is mounted. A glass shelf underneath holds a few more bottles and underneath that is a stack of cloth napkins. There was a large bouquet of pink flowers on the far end of the bar and four lights on a brass pole at the end closest to the door. Indirect lighting that bounces off the yellow ceiling provides most of the light. There were two televisions. The wooden bar chairs have faded patterned cloth seats. Behind the chairs are little booths with white tablecloths. There is a larger dining area in the back where the booths extend beyond the bar and there is room for a fair number of tables. Some upturned pinkish lights are mounted on some of the booths and there are little lamps on the wall above the others. There is a narrow glass ledge underneath the pictures in the entryway that is lit from beneath by little white lights. Chairs sit in front of it so you can sit and have a drink. Doesn’t look like it would be too comfortable though. The place was fairly crowded. I had a draft Murphy’s Stout. 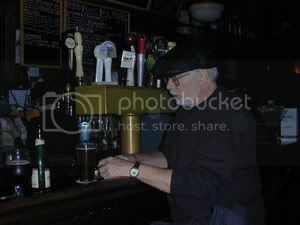 An authentic looking Irish or Scottish pub, if you call a New York pub where the bartenders wear kilts authentic. But I am too harsh. 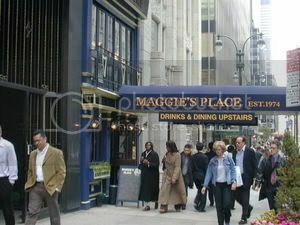 This is by no means a touristy place even though it is just a block off the bustle of Times Square at 120 West 44th Street.. There is a very long wooden bar with a brass rail. They offer a nice large selection of bottled and draft beers. They also have a large selection of single malt Scotches and a number were unfamiliar to me: a 14 year old Scapa, a 14 year old Springbank, and a 1989 Bruishladdich are a few examples. The beer, wine, and Scotch selections are displayed behind the bar above the mirror backed shelves that hold a nice selection of liquor and a display of their bottled beers. The selections are written in multi-colored chalk on three large blackboards. There are a lot of golf related pictures on the walls. There is a pleasant clutter behind the bar including a decent selection of drink related books. The fellow next to me, with whom I had a chat about beers asked to consult one. He was also given a small sample of the beer that I was drinking because the bartender overheard him asking me about it. Friendly and accommodating bartenders, even if they were wearing skirts, er, kilts. A small ledge is behind the bar chairs and it too has a brass rail. There are good sized antique glass light fixtures over the bar and a couple of fixtures each holding five lights with small parchment type shades behind the bar. There is a large wrought iron fixture with nine similarly shaded lights hanging from the ceiling in the back. There are also big overhead glass light fixtures hanging over the few tables in the small dining area in front of the bar by the entry. A good selection of songs playing, in the background ranging form AC/DC to The Zombies. If you ever get to Times Square take in the sights, by all means, but then do yourself a favor and duck in here for a drink or two or three. I had a draft Chimay. Right across the street from St. Andrew’s is this very nice looking Italian restaurant with a most pleasant bartender named Nina. It has a classic wooden bar with a brass rail. Small, but appropriate for the type of place this was. Old looking back to the bar with mirrors and shelves. Coolers with ornate wooden doors that had small decorative glass windows were below the shelves. Interesting old fashioned looking lamps, each a different style, hung behind the bar. Over the bar were three large light bulbs with ridged glass shades. Behind the bar chairs that had bright red seats the orangish yellow wash walls were covered with stills from Italian films. There is also a table laden with various appetizers that provided a temptation. I withstood it though having gotten in trouble the day before for not having an appetite for the soup that had been prepared for me. That was because I ate ice cream when I got home though. There is a pizza oven in the back where there is a decent sized seating area. Gauzy mauve and dark pink bunting drapes the front area and a large pulled back tan drape separates the bar from the back dining area. The floor is made up of small, multi-shaded, light-tan, mosaic tiles. Multi-colored cone shaded lights hang over the few tables in front by the window. This is a most pleasant looking place and they have a couple of large dining areas downstairs that have very nice multi-colored floors and interesting art work on the walls. This is a very comfortable bar and restaurant and I was especially intrigued by the Piatto di formaggi – a platter of cheeses ranging from mild to pungent, creamy to firm, served with varietal honeys. 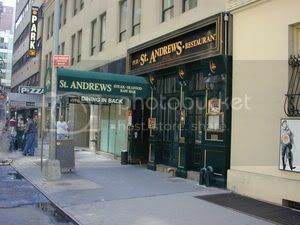 A great night would be a few drinks at St. Andrew’s and then dinner here, or the other way around. I had a nice glass of Chianti and headed on home. A very pleasant day with some nice bars and a restaurant discoverd. My three for the day brings my total to 521 leaving me with 479 to go. 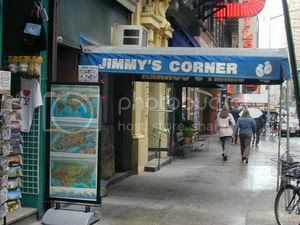 Today I decided to go to three bars that are listed in one of my favorite guides, “Jimmy’s Best New York Irish Pub Guide” This has a couple of nice maps of Manhattan. One shows the subway lines and the larger one, which only shows Manhattan below 83rd Street, has the locations of 80 Irish bars marked with red numbered circles. An invaluable, if somewhat incomplete, guide. 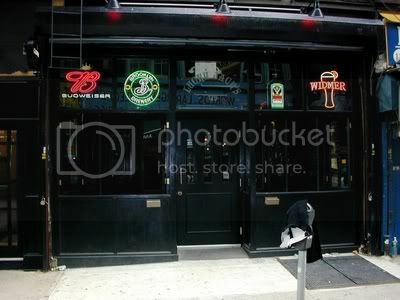 A classy Irish pub not far from Grand Central at 9 East 45th Street. I gather from the fact that three out of the four televisions are showing CNBC instead of sports that this is pretty much a businessman’s bar. It has a nice wooden bar with a bar rail. Silver stations with a decent number of spigots sit on the bar. Fairly fancy glass shelves and mirrors are behind the bar. The upper shelves hold interesting glass vases, martini glasses filled with clear glass marbles, and a display of framed certificates and letters of commendation. The lights over the bar have pretty blue glass shades inside of larger clear glass shades that look like inverted wine goblets. The walls behind the bar chairs has dark wood paneling going up about a third of the way, then are dark red for another third of the way. Above the dark red portion is a narrow ledge and above that the walls are a pale orange. There are some interesting pictures on the wall, watercolors of the New York Stock Exchange, Wall Street, what looks like an Irish Day parade, and one of people having a good old time in a large beer hall. The ceiling is patterned tin and the floors are wood. There are a few tables up front next to a stairwell leading to an upstairs eating area. Two globe lights sit on pillars at the bottom of the stairs. Cone shaped white glass with a blue pattern shaded lights hang over the tables downstairs. There is another small seating area in the back. I had a draft Heffweizen. A couple of blocks away at 21 East 47th Street is this much more authentic looking, and smelling (French fries and beer) Irish pub. And three of the four television were tuned to ESPN with only one tuned to CNBC. 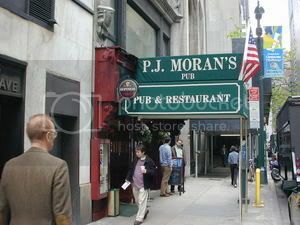 A sign outside claims it is the oldest family owned Irish pub in New York. There is a decent sized wooden bar with a brass rail. Wood cabinetry behind the bar has shelves with mirrored backing in the middle and kind of crackly glass with Irish crests in four sections, two on either side of the mirrors. Those four panels have tiered shelves for liquor in front of them. There are three nice brass stations for their beer spigots and they have a decent selection. Behind the wooden bar chairs with black seats is a row of small two person tables extending from the dark wood wall. Neat old fashioned looking lights are mounted on the wall above the tables. There is a dining area in the back and the entryway is flanked by two columns that have kind of pinkish tinted globe lights sitting atop. The floors hera are wood and the ceiling is dark wood panels. Recessed spot lights illuminate the bar and the rest of the place. I had a draft Speckled Hen, one of my favorites, served in an authentic Speckled Hen glass. I would have liked to have stolen it. Moving up one block to 3 East 48th Street I hit this classic Irish pub marred only by recent, and cheap, looking signs taped to two nice mirrors with metal floral designs. The stark white, and quite cheesy looking signs with the Scotch tape holding them up rather sloppily applied advertises such “traditional” Irish drinks as the Bikini Martini, the Angel Kiss Martini, and the Carmel Appletini. Uggh. The bartender’s only comment when I asked him about this travesty was that the signs sold drinks. There is no accounting for taste. Ah well, there is now a Starbucks in the Forbidden City in Beijing. The rest of the place is pretty decent though, an old wooden bar with a brass rail and wood bar chairs with dark green vinyl seats and a pretty standard behind the bar setup. Neat stuff on the wall behind the bar chairs; a mosaic image of Brendan Behan and a few large Leroy Neimann prints, one of a dejected looking Joe Namath. There is a small dining area in the back and maybe one upstairs. There are colorful flapper era pictures on the walls back there. CNBC was on showing on all five televisions. I had a Dewar’s and soda and headed home. A fairly standard three bar day bringing my total up to 518 and leaving me with 482 to go. I was going to go to DBAs but never made it. First off the local subway wasn’t making local stops until 42nd Street and DBAs is down between 2nd and 3rd. I had planned on getting off at Bleeker but ended up having to go up to 14th. Nonetheless I started to walk to it and somehow missed the place. 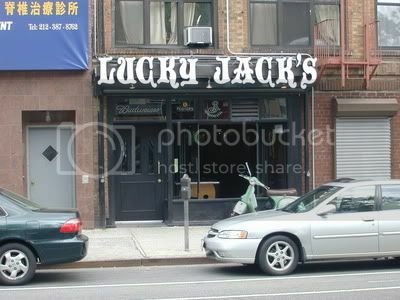 Instead I ended up further downtown than I intended and went to Lucky Jack’s instead. I had planned on then walking to DBAs but it had started to rain so I just headed back home. Ah well, not every day can go as planned. This place runs the width of the block from 129 Orchard Street to Allen Street (between Delancey Street and Rivington Street. The side on Allen Street is a couple of steps up and houses the red felt covered pool table. That was the side I entered from but everyone was sitting on the other side which, going by the address, must be by their main door. Strange though, because the Allen Street entrance looks like it should be the main entrance. The bar is an ornate twisting copper covered affair that is actually two separate bars. There is a narrow black bar rail. Behind the bar that I was sitting at there is a metal chest filled with ice and a cooler with glass doors. Above that was a black shelf holding the liquor. Above the liquor is a good sized mirror with an ornate frame. Next to the mirror are two small shelves displaying their selection of bottle beers. To the left of that is a framed blackboard displaying their draft beer selections. To the left of that are about fifteen small shelves protruding from the brick wall, each holding one or two bottles of single malt Scotch or specialty bourbon. The walls are brick and the ceiling is patterned tin. On the wall behind the wood bar chairs with black seats is a narrow shelf with barstools in front of it. Above the ledge is a large mirror flanked by large, framed 50’s style pinups. There were a couple of televisions showing the Yankees/Mets game. Good Irish tunes playing on the sound systems including the Pogues. When I left the bartender said I should stick around because her boss was going to be coming in and showing her how to make some of the house specialty drinks. She said there would probably be a lot of samples available. I declined, thinking I was still going to make it to DBA. I should have stuck around. I had a Guinness and called the game on account of rain. Just one for the day making it 515 for the year and leaving 485 to go.